Julius Rosenwald (August 12, 1862 – January 6, 1932) was an American clothier, manufacturer, business executive, and philanthropist. He is best known as a part-owner and leader of Sears, Roebuck and Company, and for the Rosenwald Fund, which donated millions to support the education of African Americans and other philanthropic causes in the first half of the twentieth century. Over the course of his life, Rosenwald and his fund donated over $70 million to public schools, colleges and universities, museums, Jewish charities, and black institutions. The school building program was one of the largest programs administered by the Rosenwald Fund, contributing over $4 million in matching funds to the construction of over 5,000 schools throughout America. These schools became known as "Rosenwald Schools." Rosenwald credited his philosophy of giving to the Jewish tradition of charitable giving known as "tzedakah," which he observed in the examples of his parents' lives. Julius Rosenwald was born to clothier Samuel Rosenwald and his wife Augusta Hammerslough Rosenwald on August 12, 1862. They were a Jewish immigrant family from Germany. He was born and raised just a few blocks from the Abraham Lincoln residence in Springfield, Illinois during Lincoln's presidency of the United States. Julius experienced the presence of charity in his life from a young age. His Jewish upbringing ingrained in him charitable traditions of giving. Instances of tzedakah, the dutiful giving of charity, were regularly observed both in his childhood and naturally carried into adulthood. His mother participated in the Ladies' Benevolent Society, whose service activities included sewing garments for unemployed persons during the winter season. He attended Chicago Sinai Congregation for religious services which he accredited for the development of his vision for humanity. By the time he was 16, Julius' parents apprenticed him to his uncles in New York City to learn the clothing trades. While in New York he befriended Henry Goldman and Henry Morgenthau, Sr. With his younger brother Morris, Rosenwald started a clothing manufacturing company which was ruined by a recession in 1885. Rosenwald had heard about other clothiers who had begun manufacturing clothing according to the standardized sizes that had been collected during the American Civil War, rather than exclusively custom–fit clothing. He decided to try the system but closer to the rural population that he anticipated would be his market. He and his brother therefore moved to Chicago, Illinois. Once in Chicago, Julius and Morris enlisted more help from a cousin, Julius Weil, and together they founded Rosenwald and Weil Clothiers. In 1891, Rosenwald married Augusta Nussbaum, a daughter of a competing clothier. Together they had five children, Lessing, Adele, Edith, Marion, and William. Lessing became a prominent businessman, following his father in the chairmanship of Sears, Roebuck & Company (1932-1939). Rosenwald died at his home in the Ravinia section of Highland Park, Illinois, on January 6, 1932. The Sears Company had originally been founded by Richard Sears in Minneapolis, Minnesota in 1886 as a mail order watch company. When Sears moved to Chicago in 1887, he met Alvah C.Roebuck and went into business with him. They sold their original company, but founded another in 1893, which came to be known as Sears, Roebuck and Company. Rosenwald and Weil Clothiers was a principal supplier of men's clothing for Sears, Roebuck. The volumes of unsold merchandise caused by the Panic of 1893 and his declining health led Roebuck to leave the company. He placed his interest in the company in the hands of Sears who, in turn, offered that half of the company to Aaron Nussbaum. Nussbaum, himself needing backers, asked his brother-in-law, Julius Rosenwald, for financing. In August 1895 Nussbaum and Rosenwald bought out Roebuck's interest for seventy-five thousand dollars. Rosenwald worked exceptionally well with Richard Sears. Rosenwald brought to the company a rational management philosophy and diversified product lines into dry goods, consumer durables, drugs, hardware, furniture, and nearly anything else a farm household could desire. The initiation of rural free delivery in 1896 and of parcel post in 1913 by the U.S. postal service enabled Sears to send its merchandise to even the most isolated customers. From 1895 to 1907, under Rosenwald's leadership as Vice President and Treasurer, annual sales climbed from $750,000 to over $50 million. The prosperity of the company and their vision for greater expansion led Sears and Rosenwald to take the company public in 1906. Rosenwald turned to his old friend Henry Goldman, who was now a senior partner at Goldman Sachs, to handle the IPO. Richard Sears resigned the presidency in 1909 due to declining health, and Rosenwald was named president in his place. Sears, Roebuck laid low during the post-World War I recession and to salvage the company, Rosenwald pledged $21 million of his personal wealth. Rosenwald instituted the practice of Sears manufacturing its own merchandise and instituted the policy of guaranteeing full refunds to dissatisfied customers. This helped bring Sears to the forefront of the merchandising field. By 1922, Sears had regained financial stability, and two years later, Rosenwald resigned the presidency to devote his time to his philanthropies. He was appointed Chairman of the Board of Sears, a post he held throughout his life. After the 1906 financial reorganization of Sears, Rosenwald became friends with Goldman Sachs's other senior partner, Paul J. Sachs. Sachs often stayed with Rosenwald during his many trips to Chicago and the two would discuss America's social situation, agreeing that the plight of African Americans was the most serious problem in the U.S.
Sachs introduced Rosenwald to two promoters of African American education, William H. Baldwin and Booker T. Washington. Rosenwald read Washington's autobiography, Up From Slavery, and came to understand the need of gaining practical education for African Americans. Rosenwald made common cause with Washington and was asked to serve on the Board of Directors of the Tuskegee Institute in 1912, a position he also held for the remainder of his life. He also endowed the Institute so that Washington could spend less time on the road seeking funding and devote more time towards management of the Institute. Dr. Washington encouraged Rosenwald to address the poor state of African American education in the US, and he responded by providing funds for the construction of six small schools in rural Alabama, which were constructed and opened in 1913 and 1914, and overseen by Tuskegee. Built by and for African Americans, the project foreshadowed the role in education Julius Rosenwald would play. Inspired by the social progressivism of Jane Addams, Minnie Low, Grace Abbott, Paul J. Sachs, and Booker T. Washington and the Reform Judaism of Emil Hirsch and Julian Mack (many of whom were his personal friends as well), Rosenwald devoted his time, energy, and money towards philanthropy. Though he gave generously to Jewish charities, he opposed Zionism. "The horrors that are due to race prejudice come home to the Jew more forcefully than to others of the white race, on account of the centuries of persecution which they have suffered and still suffer." His Rosenwald Fund was established in 1917 for "the well-being of mankind." Unlike other endowed foundations, which were designed to fund themselves in perpetuity, The Rosenwald Fund was intended as a self-expiring fund to go out of existence following his death. In doing so, the fund was completely spent by 1948, having contributed total of $22,244,174 since 1917. Over the course of his life, Rosenwald and his fund donated over $70 million to public schools, colleges and universities, museums, Jewish charities, and black institutions. The school building program was one of the largest programs administered by the Rosenwald Fund, contributing over $4 million in matching funds to the construction of over 5,000 schools, shops, and teachers' homes in the south. These schools became known as "Rosenwald Schools." Rosenwald gave $1,000 grants to the first 100 counties in the United States to hire County Extension Agents, helping the U.S. Department of Agriculture launch a program that was very valuable to rural Americans. He was also the principal founder and backer for the Museum of Science and Industry in Chicago, to which he gave over $5 million and served as the President from 1927-1932. He contributed heavily to the University of Chicago, and founded dental infirmaries in the public schools. Embree, Edwin R., and Julia Waxman. 1949. Investment in people; the story of the Julius Rosenwald Fund. New York: Harper. Werner, M. R. 1939. 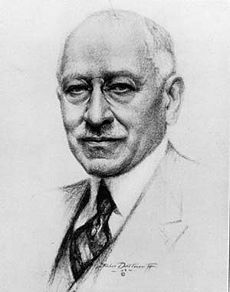 Julius Rosenwald; the life of a practical humanitarian. New York and: Harper & brothers. Granat, Diane. Saving the Rosenwald Schools: Preserving African American History The APF Reporter. Retrieved March 22, 2007. Roberts, Alicia S. Rosenwald, Julius Learning to Give. Retrieved April 4, 2007. Julius Rosenwald (1862-1932) Sears Archives, 2004. Retrieved April 4, 2007. This page was last modified on 2 April 2008, at 15:34.